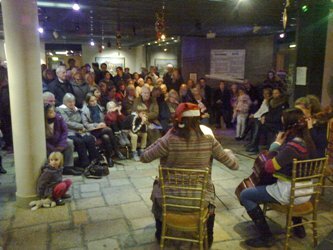 A wonderful and unique event to end the term with, the reception hall of the Jersey Museum was transformed into a ‘christmassy concert hall’ with over one hundred children, young musicians, families and friends packed in to hear the music performed. This ranged from some of the youngest students having their first opportunity to perform in a concert, to performances given by some of the older and more advanced students. There was plenty of Christmas Cheer to be found, with the Jersey Museum cafe/restaurant very kindly laying on mulled wine and canapes for everyone. Our thanks go to Jersey Heritage for their partnership in this event, and we hope to make this a regular feature of the winter programme of events.